Ive played 2 tournaments so far, and had a semi-deeprun in the 215€ Warmup. My first table was super soft, i was able to play nearly every hand. I build up a good stack really fast, and it was kinda easy game. With 15 left I was 2nd in chips, and then the "run" was over. I got it in with monsterdraw against 2 people for 2,5 x CL pot and the board bricks. Yesterday I played the 150€ NL HE tournament and had an OK stack with 35 players left. Then a buddy of mine came to our table, and I lost nearly all my chips to him. He was also the guy which busted me with AT > QJ, so unfortunatelly no cash this time. 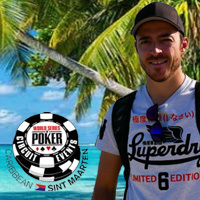 Today Im going to play the 864 € KO tournament. Its kinda strange structure, because you dont get the 400€ KO instant - the KOs will be payed for every 3rd person which gets knocked out, and noone knows if there is a KO on the player or not. Im looking forward to make a final table in this series, lets hope for the best. If i play some tricky hand Im going to post it here, stay tuned.